Last Memorial Day weekend, Bruce Boe made a trip from his home-town Fargo, N.D., to Calgary, Alberta, to get his team of technicians, pilots and meteorologists geared up for another hail season in the Canadian province. From a turbo-twin Comanche seeding aircraft, a well-organized storm is visible in the skies above western North Dakota as a target for a cloud-seeding operation to reduce potential hail damage. The planes operator, Weather Modification, Inc., is one of a handful of U.S. companies that participates in cloud seeding. Photograph is by Josh Mlnarik, courtesy of the North Dakota Atmospheric Resource Board. Their mission this summer: to fly into the flanks of dangerous thunderstorms, precisely drop special ice-like particles into the clouds, and hopefully reduce the havoc hail could otherwise wreak in the region. This is their 11th summer in the field, and their customer is the provinces property and casualty insurance agency. Hail storms in the region have been known to incur hundreds of millions of dollars in damage in just a few minutes. And they are not just nudging hail. Boes company uses cloud seeding to tackle everything from increasing rainfall to dispersing fog. Their clients include U.S. state governments, crop farmers, insurance agencies and other groups globally. Weather Modification is one of a handful of companies working on such issues in the United States. Although federal funding peaked for cloud seeding experiments in the 1970s and is now nearly nonexistent, recent natural hazards, including last years record-breaking hurricane season, are revitalizing the field. But weather modification suffers from an image problem: No scientific consensus exists on whether the techniques actually work. Still, at least 10 states have active cloud seeding programs, and at least 24 countries around the world participate in some form of weather modification. New computer modeling, weather observation techniques and instrumented aircraft, as well as possible federal research funding, are giving the field a boost. These modern-day rainmakers hope to be able to more accurately predict, and then perhaps better change, the weather. The early days of weather modification experiments in the United States sound like something out of an X-Men comic book. Stormfury, Skywater, Skyfire  all were names of big-budget federal cloud seeding experiments in the United States in the 1960s and 1970s. 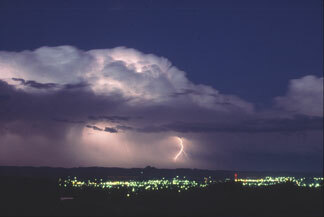 Stormfury aimed to control hurricanes, Skywater was an experiment to increase snowpack and rainfall, and Skyfire involved lightning suppression. That time period was the heyday of U.S. weather modification research, says Joe Golden, a senior research scientist at the University of Colorados Cooperative Institute for Research in the Environmental Sciences, who worked on Stormfury, starting as a graduate student in the early 1960s. Led by the National Oceanic and Atmospheric Administration (NOAA) and supported by the U.S. Navy, Stormfury in the end had controversial results that would foreshadow the problems to come for the research area. While one Stormfury cloud seeding experiment caused the inner eye wall of a hurricane to collapse and general wind speeds to decrease, when the research team seeded another hurricane, nothing happened. Ultimately, the program had inconclusive results. Golden says that measuring the success of any weather modification experiment is the holy grail of the discipline. Take hurricanes, for example. Meteor-ologists now know that the collapse of the inner eye wall of a hurricane is a natural phenomenon, so if the collapse happens after a seeding experiment, it is difficult to know whether the event is the result of the experiment or coincidental. Likewise, if a hurricane intensifies after seeding, people could blame the experiment for resulting in damage, even if the strengthening was natural. Because of that uncertainty, Boe says, hurricane seeding comes with a high liability. And in the 1980s, the federal government decided Stormfury was no longer worth the risk, so it shut down the program. The lack of definitive results in the other federal weather modification projects was also responsible for their eventual termination, says Boe, who got his start in weather modification as a college freshman, working with the Skywater project, which was seeding clouds in his hometown of Miles City, Mont. Boe later went on to work in cloud seeding operations for the Bureau of Reclamation and the state of North Dakota, before joining Weather Modification in 2001. States, as well as water boards, utilities and ski areas, are now the major supporters of cloud seeding operations in the United States, where the technology is used primarily as a water management tool. Whether or not such operations work is debatable. In a North Dakota project to mitigate hail damage and increase rainfall, for example, which was paid for with local county taxes, the statistics all suggested it worked, and the sponsoring farmers all suggested it worked because they kept paying for it, Boe says, but analysis has been tricky. Since the North Dakota projects start in the 1970s, Boe and colleagues have analyzed insurance statistics that suggest a 45 percent reduction in crop hail damage in the target area during the project. But I have to say that crop hail damage using insurance statistics is not without its flaws because not everyone buys insurance, he says, so the numbers are skewed. But while evaluating the success of any weather modification project has been difficult, Boe says, cloud seeding has come a long way since its early days. We know what the effects of the seeding agent are on the cloud, he says. The seeding agent is delivered in most cases directly to the clouds or in very close proximity to the clouds, and it is done in a timely fashion when the clouds are in the right state. Its a far cry from when people first started cloud seeding. Although the concept of cloud seeding was formulated in the 1920s and 1930s, the major advancement for the field came in 1946, when scientists working at General Electric discovered that crystals of silver iodide can form ice crystals in some water vapor. Shortly after, the U.S. Army Signal Corps paired with General Electric to begin cloud seeding experiments. The technology has since advanced greatly, but the basic principle remains the same: Deliver a seeding agent to a cloud to alter the way water forms and moves through the cloud. To increase precipitation, scientists use two basic approaches, Boe says: glaciogenic seeding and hygroscopic seeding. 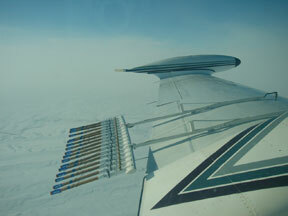 Burn-in-place silver iodide flares await use during a wintertime cloud-seeding mission to increase snowpack in Wyoming. The silver iodide initiates ice formation in extremely cold clouds faster than nature would on its own, so that the clouds have time to produce precipitation. Photograph is by Erin Fischer, WMI; courtesy of the Wyoming Water Development Commission. Glaciogenic seeding uses agents, such as silver iodide, that initiate ice formation in clouds colder than 0 degrees Celsius and have supercooled water. In these clouds, nature doesnt produce ice until about minus 15 degrees Celsius or sometimes significantly colder than that, Boe says, because of a lack of particles that can act to form ice. Silver iodide has a crystalline shape very similar to natural ice, so it can create ice at warmer temperatures. If you can initiate ice development sooner in the clouds lifetimes, that leaves more time for the cloud to actually grow precipitation-sized particles and put them toward the ground, he says. If the clouds are not supercooled, however, scientists use hygroscopic seeding, in which the seeding agent is usually a simple salt. Normally, little drops of water collide to become large raindrops, but in some clouds, the drops do not coalesce. The seeding agent, however, can sweep them out and grow the drops, which will actually produce rain, Boe explains. Other forms of weather modification use these two techniques as well. Hail damage mitigation relies almost exclusively on glaciogenic seeding. What youre trying to do is to create more small ice particles in the storm, so that they compete with one another for the available unfrozen but supercooled water, Boe says. As they compete and fall through the air, especially warmer air in the summertime, they often melt and reach the ground as rain instead of hail. Even if youre unsuccessful at melting them all, at least the ones that do reach the ground are going to be on average significantly smaller, he says. Another popular area of weather modification is increasing snowpack, whether for a municipal water board or a ski resort. Again, a glaciogenic agent is the way to go. To measure the success of such seeding in increasing snowpack, Weather Modification has paired with the National Center for Atmospheric Research in Boulder, Colo., in a five-year program, paid for by Wyomings water development commissions. A final area of cloud seeding operations in the United States is fog dispersal, which is the simplest thing to work with, Boe says. If the fog cloud is supercooled, a glaciogenic agent can create ice, which then uses up the water droplets and clears the air. Airports are the main customer for this type of seeding, but very few participate. Although a supercooled fog can persist for days and shut down an airport, he says, few regions suffer from such fog. Salt Lake City, Utah, is one such at-risk spot, and its airport has its own ground-based seeding program in place. The University of North Dakota in Grand Forks even has a pilot training course on weather modification. Although the course may not help with airsickness, it will help pilots recognize where and in what conditions it is safe to enter a potentially dangerous storm. Pilots are on 24/7 call for weather modification operations such as those Boes company conducts. Likewise, meteorologists monitor the skies around the clock, calling in the flight crews when the conditions look right. The Alberta hail damage mitigation program this summer, for example, will use about 20 people to look out for and fly into potential hail-producing storms. But although current U.S. cloud seeding operations focus on hail and precipitation, some people still have their eyes set on hurricanes. Despite the passing of Stormfury, a new generation of scientists is eager to test out some new ideas that could control the storms paths. In Stormfury, the idea was to seed an outer ring band of a hurricane with silver iodide to initiate ice formation in the colder outermost regions of the storm. The clouds would consume the energy the seeding released and grow, hopefully replacing the former eye wall and increasing the radius of the storm. Like how a spinning ice skater slows in speed by stretching out her arms, if you can form a new eye wall at a larger radius, the hypothesis was that you would weaken the maximum winds by as much as 10 to 15 percent, Golden says. Some scientists now think that part of the reason the hypothesis did not appear to pan out is that hurricanes contain little supercooled water, rendering glaciogenic seeding agents useless. In recent years, however, a number of new ideas have surfaced on other ways to approach hurricane modification. Ross Hoffman, a researcher with Atmospheric and Environmental Research, Inc., a research company in Lexington, Mass., thinks that developing better weather forecasting is a necessary first step to approaching hurricane modification, or any weather modification project for that matter. If we can make excellent forecasts either of rainfall from individual clouds or of the strength and path of a hurricane, then we know what would happen if we dont do something, Hoffman says. Only by being able to accurately forecast the weather can scientists truly evaluate modification experiments, he says. Hoffman and his colleagues are working to improve forecasts by determining the initial conditions for models  a process that involves both highly advanced computers as well as good observations. Hurricanes, he says, are especially difficult to forecast because of a lack of observations. Although some satellites can see into the center of a hurricane, many cannot, and in general, obtaining large volumes of data on the physical processes that initiate hurricanes is difficult. 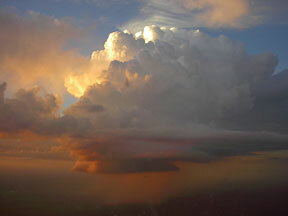 Still, Hoffmans team has taken the available data and altered the models to conduct weather modification experiments that never leave the computer. For example, they conducted a computer simulation for Hurricane Iniki which struck the Hawaiian island of Kauai in 1992, killing several people and causing substantial property damage. Instead of setting the initial conditions and seeing where the hurricane would go, they set a new target for the hurricane  100 kilometers west of the island  and changed the initial conditions to meet that target. Indeed, making these perturbations happen in the real world is no small task. Although altering wind speeds creates the most change in a hurricane, Hoffman says, a more practical tactic might be to alter the heat content of the ocean or atmosphere. Perhaps the best opportunity, he says, would be to find a way to cool the surface of the ocean. A hurricane forms and gains strength by evaporating water vapor from the oceans surface. In fact, Boe says, a hurricanes job is to take water vapor and move it north and condense it, and release the heat that was stored in the water vapor. In this way, hurricanes and other large storms balance Earths energy budget, moving heat to the poles. That is why almost all hurricanes that come ashore in the United States move north, and the opposite is true in the southern hemisphere where hurricanes tend to recurve south, again toward the pole. If researchers could cool the oceans surface, they could disrupt the heat cycle that fuels a hurricane, Hoffman says. In the past, some scientists, including Kerry Emanuel of MIT, have proposed spreading a thin oily layer over the oceans surface to slow evaporation, but evidence suggests that wave action from the storm would break up any surface film. A thunderstorm rumbles eastward after passing Miles City, Mont. Some atmospheric scientists think it will one day be possible to better control the weather, using cloud seeding and other weather modification techniques. Photograph is by Bruce Boe. Other ideas have been to somehow pump cool water from depth to the surface, but the pumping would need to be continuous. Some researchers have proposed, for example, using retired submarines to drag a device that would constantly churn cool water from the deep ocean. Recently, researchers have proposed cooling the ocean by using jet engines to entrain warm air and create humid plumes of air and updrafts from the oceans surface. Reporting in the April 2006 Journal of Weather Modification (published annually by the Weather Modification Association), Moshe Alamaro of MIT and colleagues propose deploying a barge to strategic points in the ocean that would have multiple jet engines mounted aboard. The unstable updrafts the engines create would potentially spur more storms, thus robbing the ocean of the heat needed to create a larger hurricane, and creating the atmospheric perturbations to the hurricane system that Hoffman envisions, Alamaro says. Although some of these ideas may be feasible, Hoffman says, none has been tested in the real world. Boe says that although his company has talked with some individuals about ways to possibly influence hurricanes, he is still reticent to dive into that aspect of weather modification, due to the manifold liability issues. With the spate of recent hurricanes, however, including Katrina and Rita, atmospheric scientists are sure to continue pursuing some of these ideas. Hoffman is optimistic: Everything you can imagine to modify the weather, I think is possible, he says, given more time to develop more detailed and accurate computer models and collect better data. Despite the flurry of activity in U.S. weather modification, weve fallen behind, way behind, Golden says. He recently testified to such before a Senate subcommittee hearing on S.517, the Weather Modification Research and Technology Transfer Authorization Act. The bill, introduced by Sen. Kay Bailey Hutchison (R-Texas), would provide $10 million a year over the next 10 years for research into weather modification. Such funding, Golden says, could provide the boost U.S. research needs to develop more accurate forecasts and to catch up with the international community. Many countries around the world have active weather modification programs, including China, which reportedly has one of the worlds largest such programs, spending $100 million per year. In recent months, news reports have described several cloud seeding experiments China has undertaken in preparation for the Beijing Olympics in 2008. Those efforts have included seeding clouds to wash pollutants out of the air, as well as overseeding clouds to prevent it from raining, for example during the upcoming Olympics. The overseeding technique cannot ensure sunshine, Hoffman says, but the clouds would not be able to produce rain. Canada, Australia and European countries, among others, are also involved in weather modification. In fact, Golden says, many of these countries have adopted technologies developed in the United States in the 1960s and 1970s in their ongoing research and operations. For example, Australia is now using a chemical tracer technique developed by NOAA and the Desert Research Institute in Nevada to quantify the amount of snow increase due to seeding over mountains. Although Golden says that he does not think the federal government should be involved in cloud seeding operations, he thinks the government is vital in developing new technology to seed clouds, as well as to improve modeling and evaluate success. Evaluation is a key role of the federal government, he says. The Senate weather modification bill is expected to reach the Senate floor for general debate soon, and in the meantime, Rep. Mark Udall (D-Colo.) has introduced a companion bill in the House of Representatives. Testifying before the Senate, Golden said that the United States now has both the science and the technology to launch a new research attack on some vexing problems, including natural hazards such as hurricanes and large-scale water management challenges. No matter what, Golden says, any research has to be sustained over the long haul. People cannot simply react to short-term problems such as a drought, he says. After all, it is impossible to seed clouds, if there are no clouds there to seed.